You can shop for Jindie Nails on Etsy and Llarowe.com. 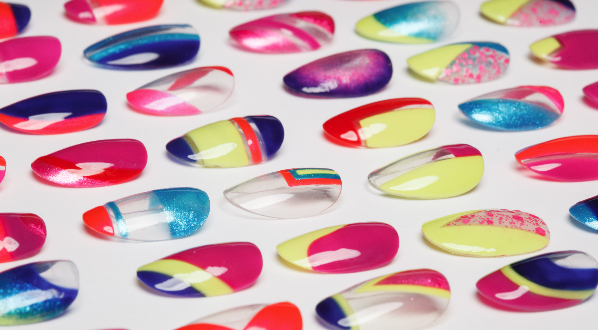 Like Jindie Nails on Facebook. Princess Breath "pale green crelly (cream jelly) base (really more of a cream base that is just right so that the glitter layers show through perfectly). I love the color contrasts in this one...the greens work very well together.This one has the rare large magenta dots. It also has the medium magenta dots, lime green and teal holo glitters, deep purple metallic glitter, satin matte teal glitters in several sizes of hex.." This was easy to apply, great formula. I have 3 coats on here and HK Girl top coat. Taste Like Snozberries "light neon purple/magenta crelly based polish that has the rare large magenta dots, plus medium magenta dots plus extra large, large, medium and smaller silver holo hex. This one also has bright blue, deep purple metallic and magenta smaller glitters." Another great formula, I have 2 coats and top coat here. Rave "white crelly based polish that has the rare large magenta dots, plus medium magenta dots, neon yellow, neon blue and neon green medium hex. This one also has bright blue gorgeous sparkly metallic and magenta smaller glitters." Love my white with glitter mixes. 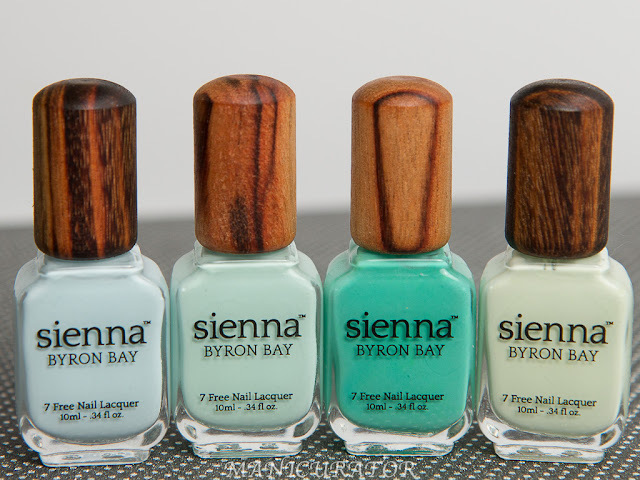 Three coats here and another great formula. Be Someone Cute "matte glitters in the colors neon pink, white and black all in a sheer pink base with hot pink micro flakies added to it." You are seeing 3 coats here, I would like to see this one next time as a top coat over a medium pink. No problems with formula or application. Purple People Pleaser "White, black & purple matte glitter and blue and lavender shiny metallic glitter in a clear base with blue shimmer." One coat shown over 2 coats OPI Hands Off My Kielbasa! Baby Doll "Satin pink, blue, lavender, green and matte white. This also has some beautiful color shifting squares in it." One coat over 3 coats OPI You're Such A Budapest. 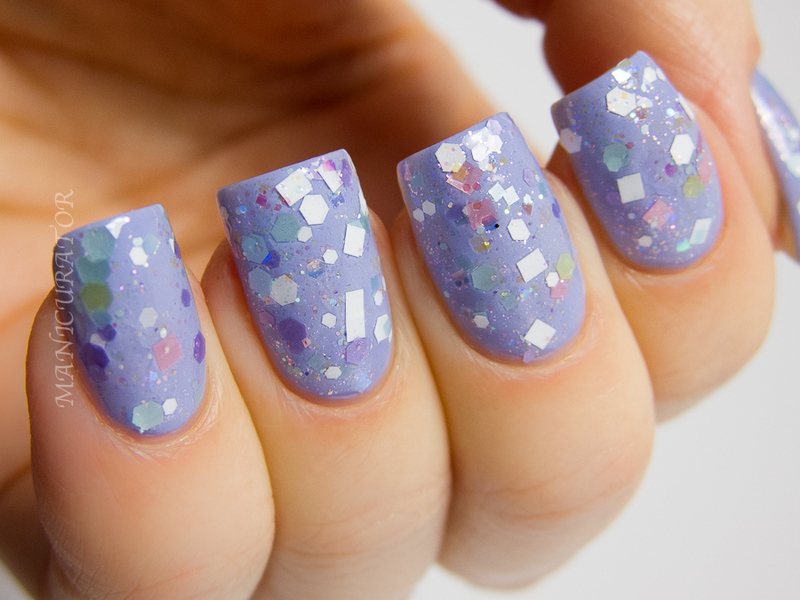 Purple Rain-bow "lavender colored shimmer linear holo". This is stunning in person. Two coats here, excellent formula. Really didn't want to take this one off! As much as I love the white with glitter polishes, I think Purple Rain-bow is my favorite from this set. I'm late to the game for sure, but I'm all of a sudden falling for holos! Do you already have a bunch? I'm just starting my holo collection and this one is just perfect. Taste like snozberries, rave and baby doll looks gorgeous and so does the holo. I actually don't own any myself,think I need to try some out though. Great swatches! The names are great and polish looks great also. I too, am late to the halo game, it's all I am wearing right now. My favorites are Princess Breath, Be Someone Cute, and Purple Rain-bow. I am late to the holo game as well. I was not enamored with them until Zoya Aurora; now I pay more attention. Your Princess Breath photos are especially stunning! Wow. Rave, Baby Doll and Purple Rain are must haves. Great pics!! Rave and Baby Doll.. WOW! I really like Rave! Huge neon glitters, yay :D Amazing swatches, like always!